Manav Sadhna decided to change Kiran Center’s name to Manav Mitra which means human friend in Gujarati and Hindi. They wanted to change it so it aligned with the rest of the centers names: Manav Seva. Manav Gulzar, and Manav Janta (Tekro Community Center). Manav Sadhna also purchased the building. They are renovating three more rooms in the back part of the center. One room will be converted into a teacher and storage space. The wall will be knocked down to make one bigger room for a class. It is the hope to have the Vidhyadham students 6-10 standards to join the center in 2 years. The local architect has been working hard in 112 degrees Fahrenheit heat in preparing for this new renovation and trying to complete this by the beginning of school on June 13th. Manav Mitra has been fortunate to hire 5 new teacher candidates that will begin when the teacher trainings begin on May 23rd. I am excited to get to know them and have a strong teaching staff at Manav Mitra! Manav Mitra had a fun end of the school year celebration in inviting the parents with their students to share their snacks with each other. There were about 50 parents that came and the teachers also asked them if they have seen the effects of the value-based education lessons in their children. 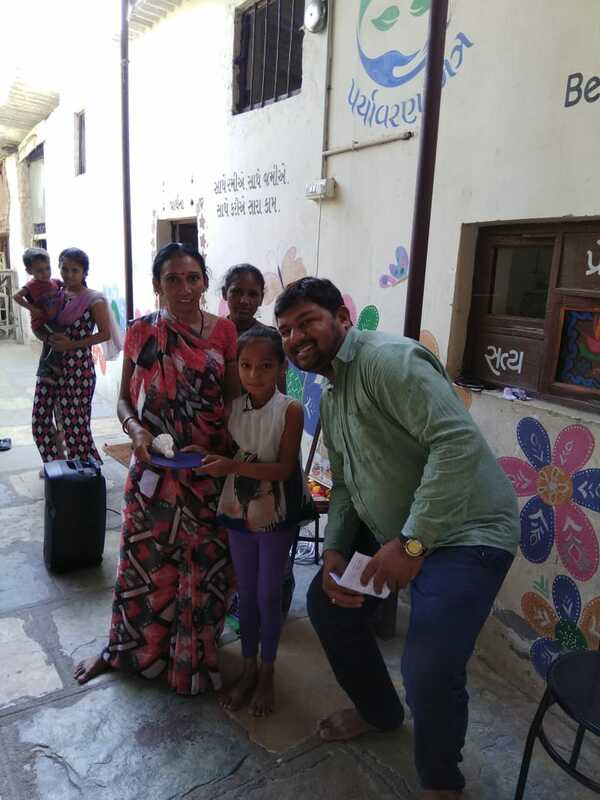 Ajaybhai asked if their children use manners, clean up after themselves, sing hygiene songs, and discuss what values they have learned this year with them. Teachers also gave out summer gifts of badminton and little water soaker toys. I was invited to train the teachers on how to make and incorporate games into their lessons. It was a fun experience to watch the teachers adapt a classic game, “Snakes and Ladders,” into values and math concepts. Thank goodness for understanding and patient education coordinators who are will to translate and make me feel included in this training. They had a good discussion on what questions to use on their “Snakes and Ladders” game board. It was fun to watch them play and get competitive with each other. The idea is to use this as an assessment tool at the end of a unit and have the students develop their own board game in small groups. Then swap the boards with another group to play. The education coordinators also invited a national guest speaker on how to see the best in our students and in each other. Teachers presented different ways to teach values and examples of various academic lessons to review the process of a lesson and the flow of timing in the classroom. We also went to see a Hindi movie, “Hichki” which is an inspiring movie about a teacher who has Tourette’s syndrome but has the passion to overcome this and goes onto teaching the toughest class at a school. Then all the teachers enjoyed a nice lunch after the weekend of training was finished. It’s been a whirlwind of changes in the last couple of months. Several of the volunteers have left to continue on with their lives in various parts of the world. That is one of the challenges being a volunteer of Manav Sadhna. The connections with volunteers is amazing and it’s hard to say goodbye to them. I’ve met so many incredible people. It is incredible to think that young volunteers are wanting to serve and make this world a better place to live in and be as young as they are. An older volunteer taught me that age is just a number that you aren’t too young or too old to serve one another. Now we are preparing for the next school year which will begin on June 13th but the first academic teaching day is on July 17th. A few of the Manav Mitra students have been helping us in preparing by making newspaper hats as a way to greet the students back to school. I have been meeting with Anjaliben to discuss the phonics curriculum. We have changed some of the phonics images to align with Indian culture images such as cricket bat, cricket ball, Indian bride, etc. I have also been going through the lesson instructions to see what to simplify and have the education team translate into Gujarati. We are also planning to have me do the phonics training with the 3 teachers that are teaching the English, one from each center: Manav Mitra, Manav Seva, and Tekro Community Center. I will be training on each concept of the phonics curriculum by discussing the reasons behind phonics, the concept progression, modeling for the teachers, then have them teach each other each concept. I will be still rotating to each center at least once a week to guide the teachers through each lesson. We really only have 24 teaching days as there are other center guest visits, field trips, holidays, and school functions to consider throughout the year. We are also planning on having at least 2 more training sessions in August and October to train the rest of the concepts as they get more challenging for students to understand. The point is to develop a strong foundation for the 3rd and 4th standard phonics curriculum to sustain once I leave. I really hope that the next teaching fellow has a strong education teaching background to be able to continue the teacher development, phonics curriculum training, and teaching.